It's clearly been a year since I've updated CotC and almost three years since I posted with any regularity. I've been posting outfits on Instagram and got a couple "I miss your blog" comments. I miss it tremendously, but so much has changed in the past few years that it's been hard to keep up with it. I no longer work in a light-filled office, I don't live in a townhouse with a fantastic deck, and I now work from home so most days it's yoga pants and a Skynnard tshirt - super fashionable, right?! But, I do leave the house a couple times a week, so that's better than nothing! This is what I wore to Weight Watchers. The navy/white dress is my "weigh in dress" so I try to jazz it up differently each week. I have a couple old ways I've worn it I'll post soon. So what's new, y'all?! Babies? Husbands? Houses? New jobs? Puppies and kittens???? Inspired by Kimberly, I'm trying to inject more color into my wardrobe. It's so dark and dank that even my husband, who doesn't care what I wear, has taken notice. All I wear is black, grey, and some dark jewel tones. Granted, these colors work for me, but I really do need to jazz it up a little. So when I saw this dress on crazy clearance at Macy's I had to get it. Seriously. How cute it is?? This necklace. Man. I've had it for years and years but never wore it b/c I didn't have anything w/the right neckline. I wear a lot of v-necks and layers so it would get lost. Then I read Tom and Lorenzo's Mad Style review of Mad Men and knew what I had to do. When I saw Megan wearing a similar style necklace (from the same period) I was thrilled. This pic is from Tom and Lorenzo's site. 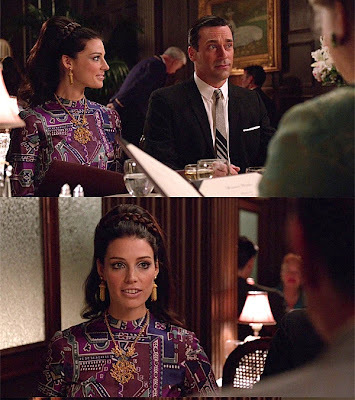 Please click through to the links above to read their fantastic Mad Men recaps and Mad Style reviews. They're seriously one of the best things on the internet. It's hard to tell, but the piece is very textured and super fancy. I loved wearing it. The only thing I'm not 100% sold on is how blousy the top is. I feel like it makes me look puffy but whatever. I suppose the belt pulls things in enough. Somehow between getting married and life and remodeling a house I sorta forgot to get a hair cut. For 2.5 years...yikes! At about a year in, I realized this and figured, "Hell, if I've gone this long, let's see how long I can go!" So I did. Is that not the most where's-her-denim-skirt ridiculous hair ever? It was past my waist and was driving. me. crazy. I knew I had to schedule a cut before I cut it myself. Say goodbye to 11-12 inches of hair! I can't believe she cut off A FOOT OF HAIR and I still had long hair. I call that a win-win situation. I get a great new 'do (which was $Free.99, by the way) and got to help out a good cause. I haven't missed my hair for a second and only wish I had cut it sooner.